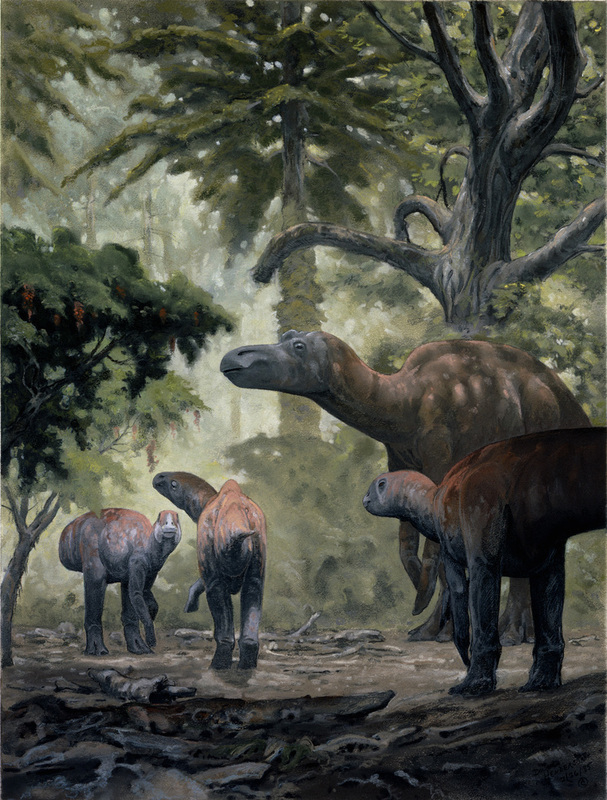 An early Cretaceous scene from Great Britain of an Iguanodon group passing a Baryonx. Pencil and graphite dust on 2-ply bristol, 17 x 24 inches, 1989. Done for the book Dinosaurs, A Global View, 1990. 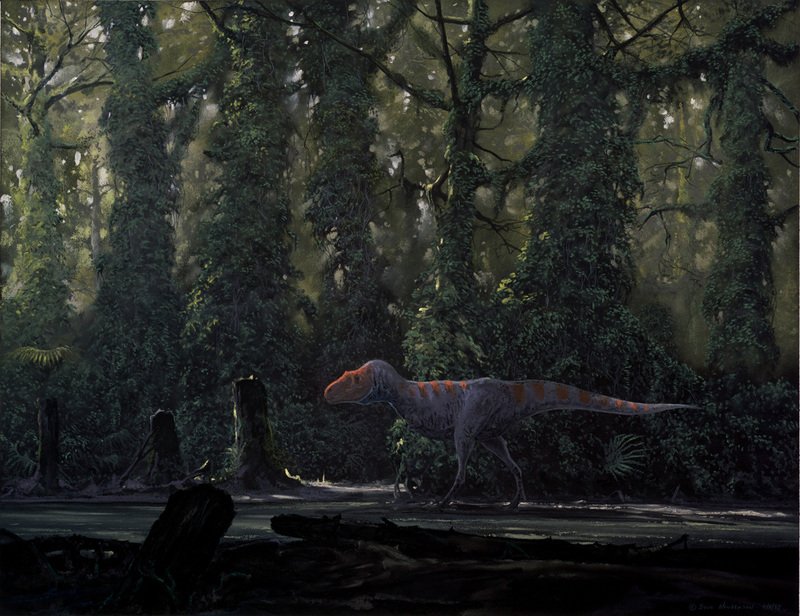 A Carnotaurus follows a stream channel through an araucaria forest in early Cretaceous Argentina. A commission set aside for a time and when returned to, I forgot to add the prominent tabs that run the length of the creature's head, back and tail. Pastel on 140lb watercolor paper, 15 x 27 inches, 1996. The carnosaur Afrovenator stalks a juvenile sauropd separated from an adult group in early Cretaceous Africa, the animals representing a late Jurassic fauna that carried on into the Cretaceous. Pastel on 140lb watercolor paper, 16 x 28 inches, 1994. 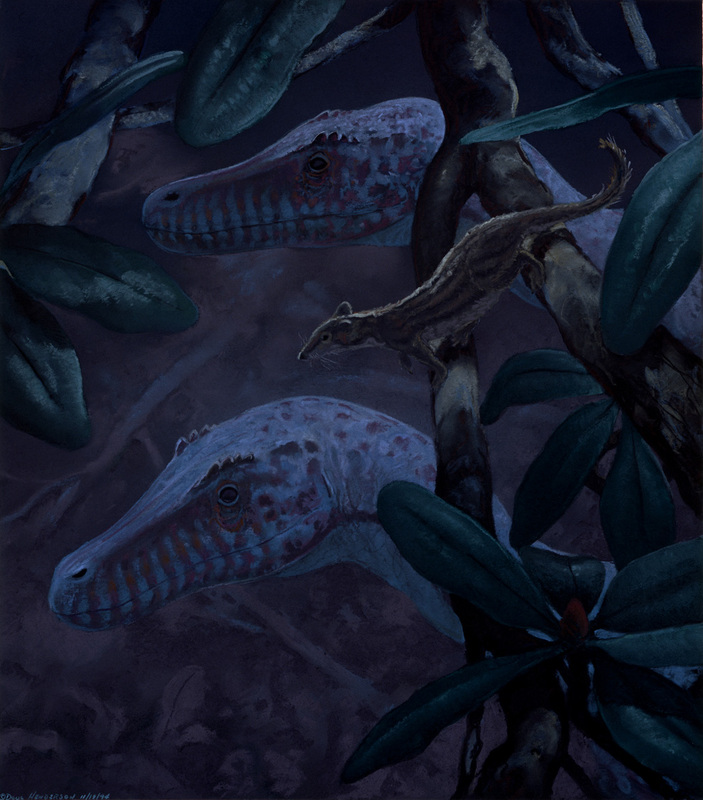 Two Velociraptors in early Cretaceous Mongolia some 100 million years ago hunt in the night, passing under a magnolia tree with the small mammal Deltatheridium poised motionless on a branch above. 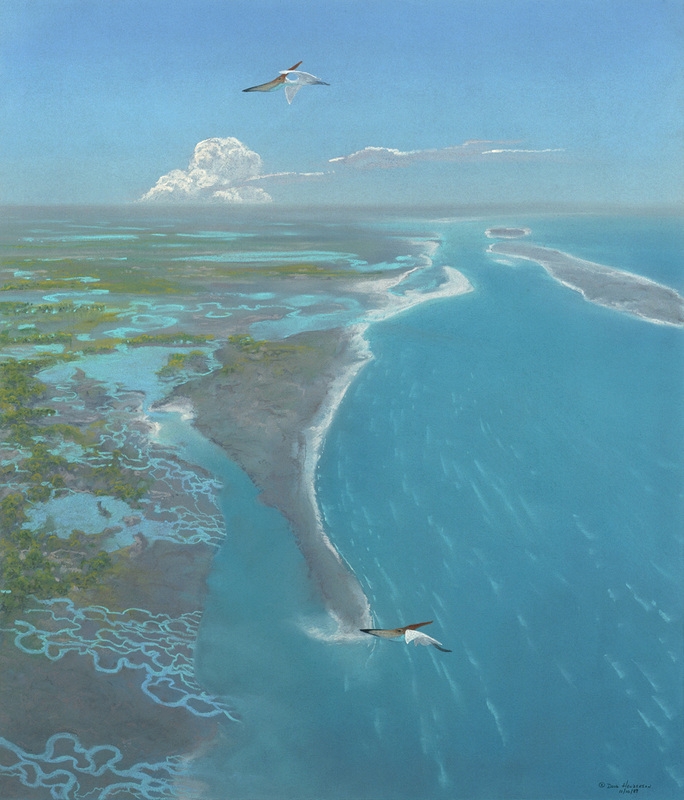 Pteranodons soar high over the coastal marshes and barrier islands where land meets the Cretaceous Interior Seaway in Montana some 80 million years ago. Pastel on 140lb watercolor paper, 19 x 22, 1989. From the children's book Living with Dinosaurs, 1991. This open edition giclee (inkjet) reproduction is of a pastel illustration I did in 1989 for the children's book Living with Dinosaurs. The image depicts a mosasaur, a marine reptile, diving to moderate depths in the warm, shallow sea that once covered eastern Montana during the late Cretaceous, some 80 million years ago. 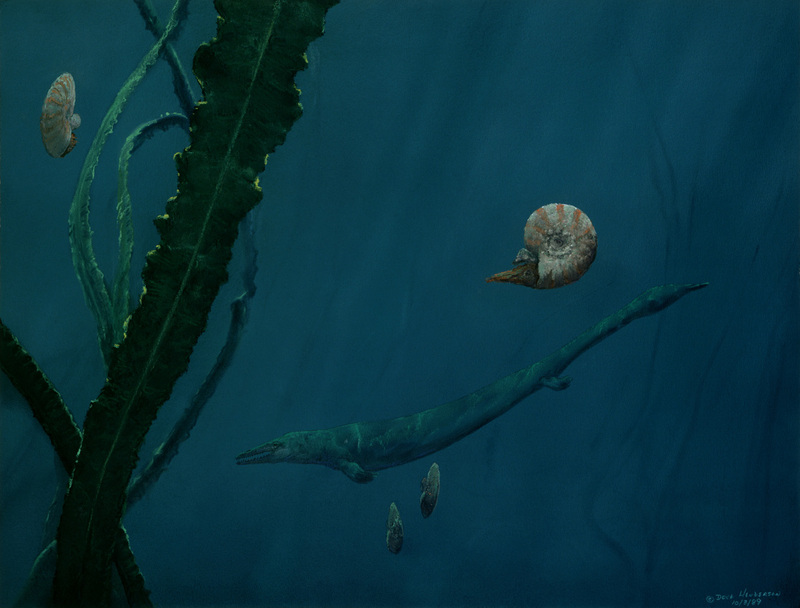 The circular, disc-shaped shells belong to ammonites, tentacled cephalopods that were abundant in the Cretaceous seas and regular food for mosasaurs. Pastel on 140 lb watercolor paper, 16 x 21 inches, 1989. From the children's book Living with Dinosaurs, 1991. A long-necked plesiosaur swims with its wing-like paddles in the warm shallow sea that covered eastern Montana during the late Cretaceous, some 80 million years ago. A large shark swims in the background. Pastel on 140lb watercolor paper, 18 x 25.5, 1989. From the children's book Living with Dinosaurs, 1991. 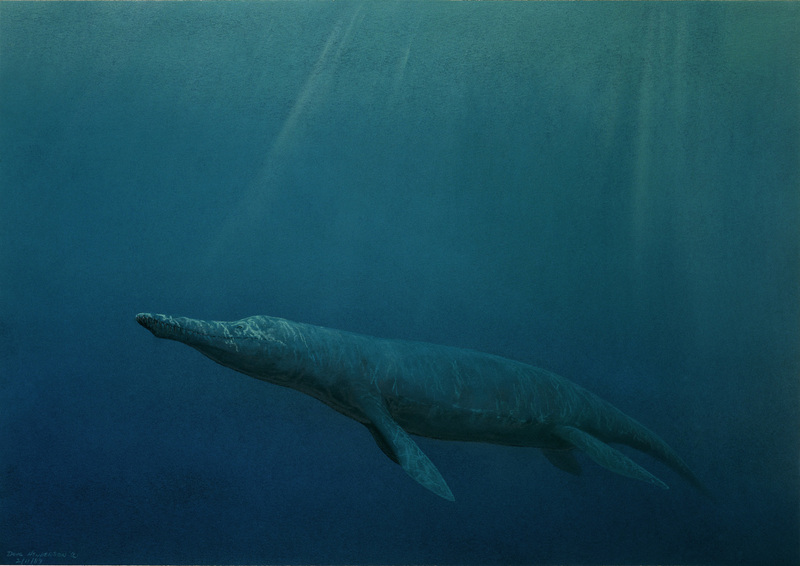 A short-necked plesiosaur, a marine reptile, floats just below the surface of an inland sea that covered central North America during the late Cretaceous some 80 million years ago. 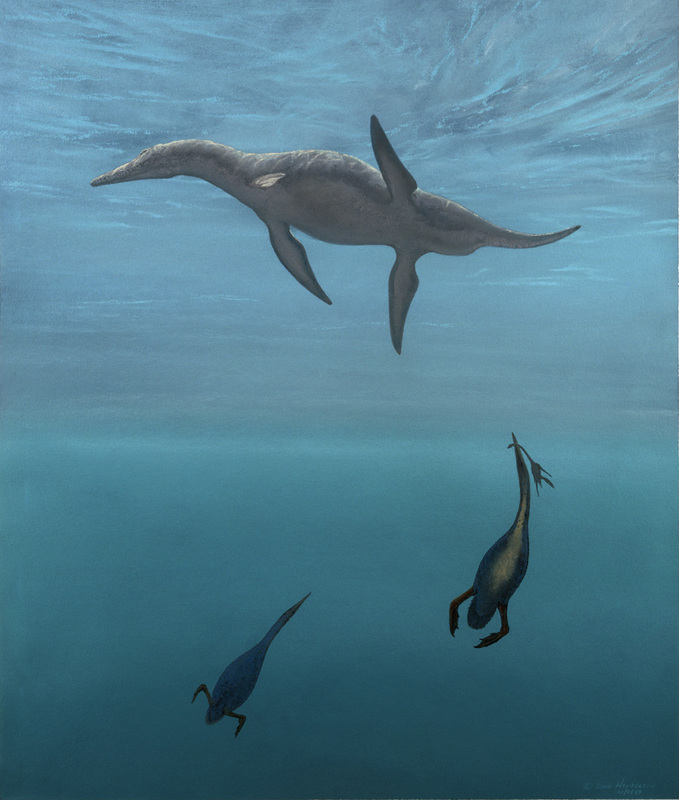 Two Hesperornis, flightless marine birds, return to the surface with a juvenile long-necked plesiosaur. Pastel on 140lb watercolor paper, 19 x 22.5 inches, 1989. From the children's book Living with Dinosaurs, 1991. 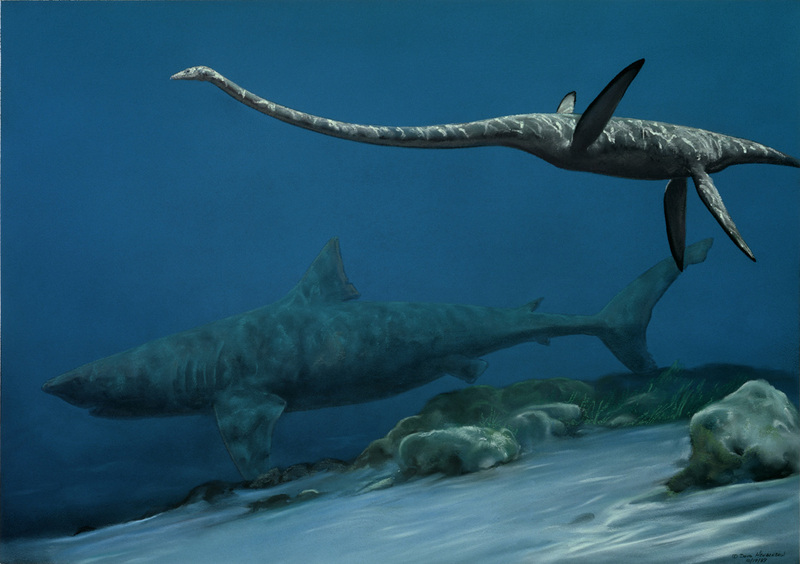 Two large Elasmosaurs, long-necked plesiosaurs, float over reef formations in a warm, late Cretaceous sea some 68 million years ago. Pastel on 140lb watercolor paper, 18 x 25.5 inches, 1989. From the book Dinosaurs, A Global View, 1991. 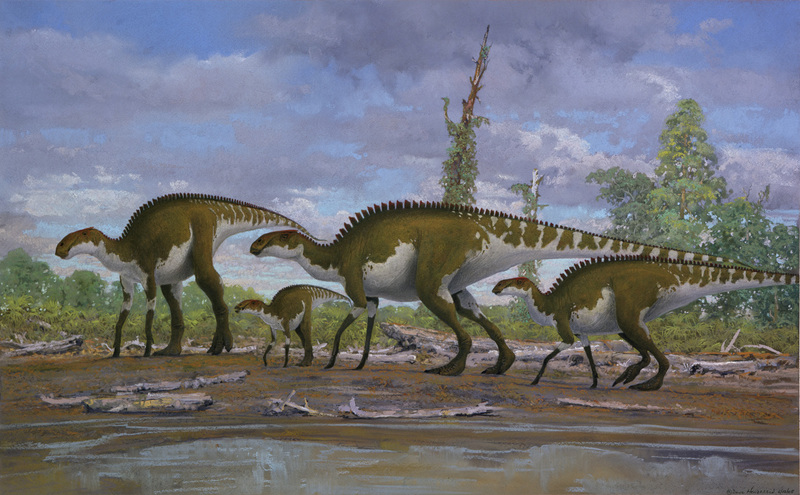 A young Maiasaur named Maia and her siblings wander to the end of the Cretaceous Inland Sea in Montana. Pastel on 140lb watercolor paper, 18.5 x 19.75 inches, 1983. Done for the children's book Maia, A Dinosaur Grows Up, 1987. 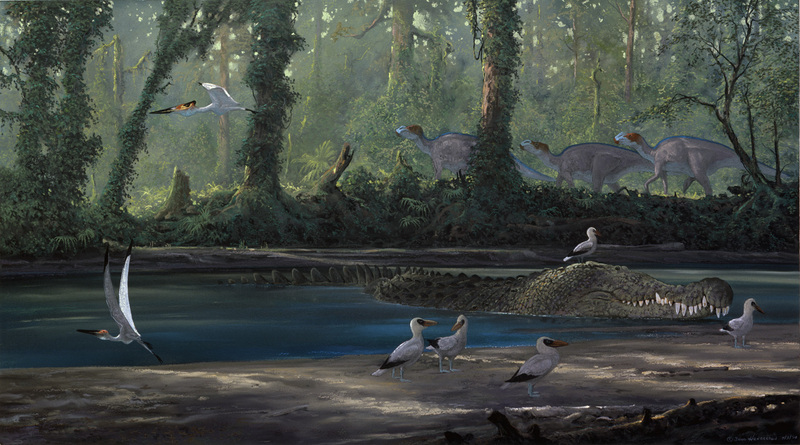 The large Cretaceous crocodile Dienosuchus rests near a small group of ichthyornis (birds) and pterosaurs (flying reptiles), with a troop of Kritosaurus (duckbill dinosaurs) passing in the background. 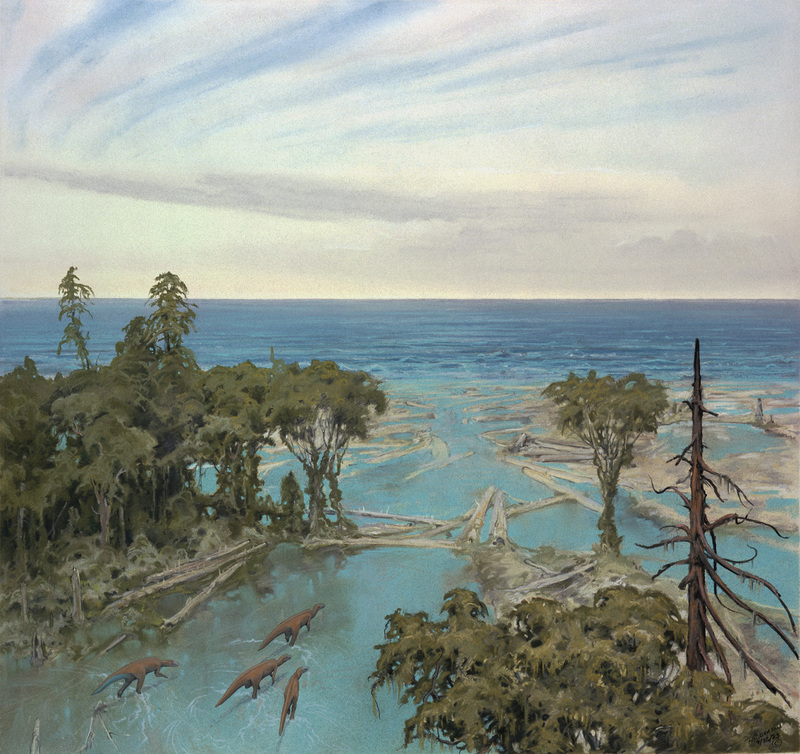 The scene represents the marshy coastal regions of Montana during the late Cretaceous some 80 million years ago. Pastel on 140lb watercolor paper, 15.5 x 28 inches, 1990. From the children's book Living with Dinosaurs, 1991. 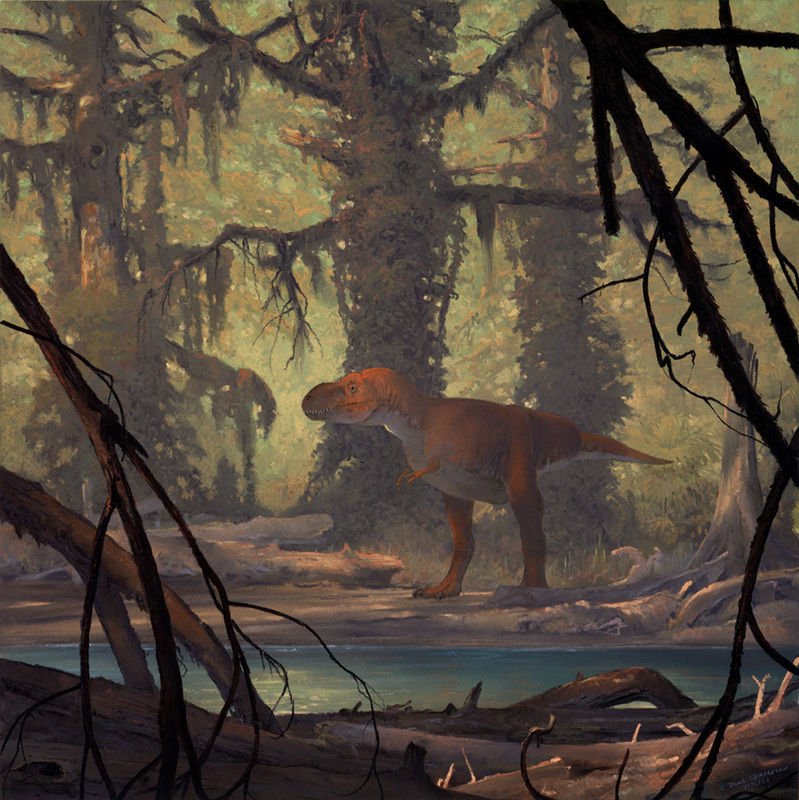 Albertosaurus, a late Cretaceous carnosaur common throughout the western US from 80 to 65 million years ago, strides across a stream lined with oak, magnolia, dogwood and fig trees. Pastel on 140lb watercolor paper, 18 x 25.75 inches, 1988. From the book Dinosaurs, A Global View, 1990. Pastel on 140lb watercolor paper, 17 x 22 inches, 1989. From the children's book Living with Dinosaurs, 1991. 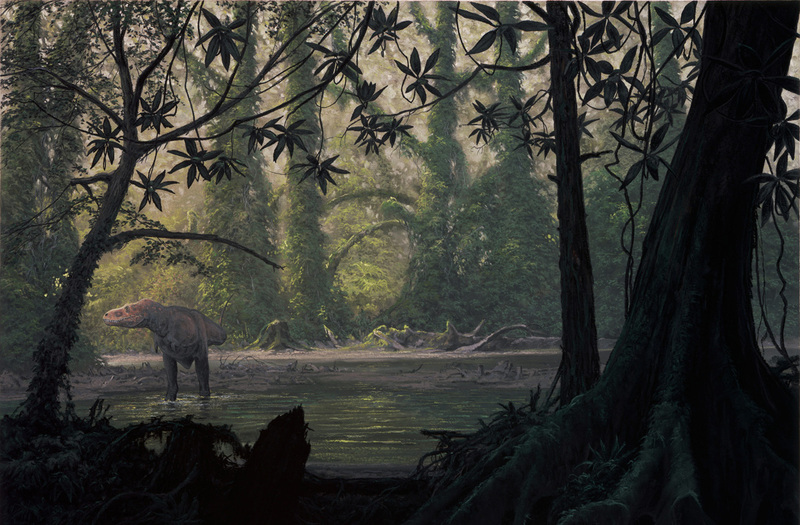 Corythosaurs, crested duckbill dinosaurs from the late Cretaceous of Montana 80 million years ago, forage in a semi-tropical lowland forest of sycamore, magnolia, cycads, and pandus (screw pines). Pastel on 140lb watercolor paper, 17.75 x 23, 1990. From the children's book Living with Dinosaurs, 1991. 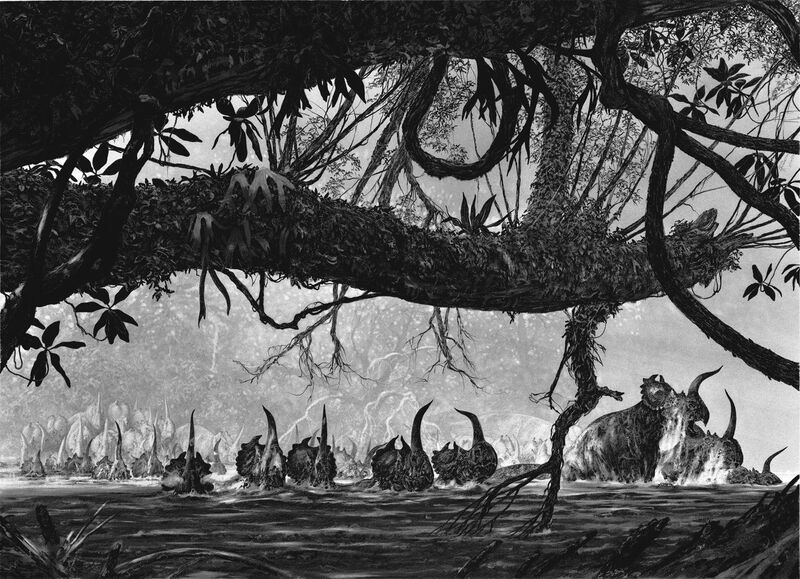 A group of Centrosaurus ford a flooded river in Alberta, Canada during the late Cretaceous some 80 million years ago. Pencil and graphite dust on 2-ply bristol, 18.5 x 25.625 inches, 1989. From the book Dinosaurs, A Global View, 1990. The small ceratopsian Leptoceratops travels through a jumble of fallen sequoia and bird ferns in Montana during the late Cretaceous, some 80 million years ago. Pencil and graphite dust on 2-ply bristol paper, 13 x 19 inches. Two large pterosaurs fly above a semi-arid, upland landscape along the front of the Ancestral Rocky Mountains in Montana during Two Medicine time, some 80 million years ago. Pastel on 140lb watercolor paper, 18 x 25.5 inches, 1989. From the book Dinosaurs, A Global View, 1990. This open edition giclee (inkjet) reproduction is of a pencil drawing I did in 1985, one of a series of illustrations done for the Museum of the Rockies representing the 80 million year old Two Medicine Formation in Montana. 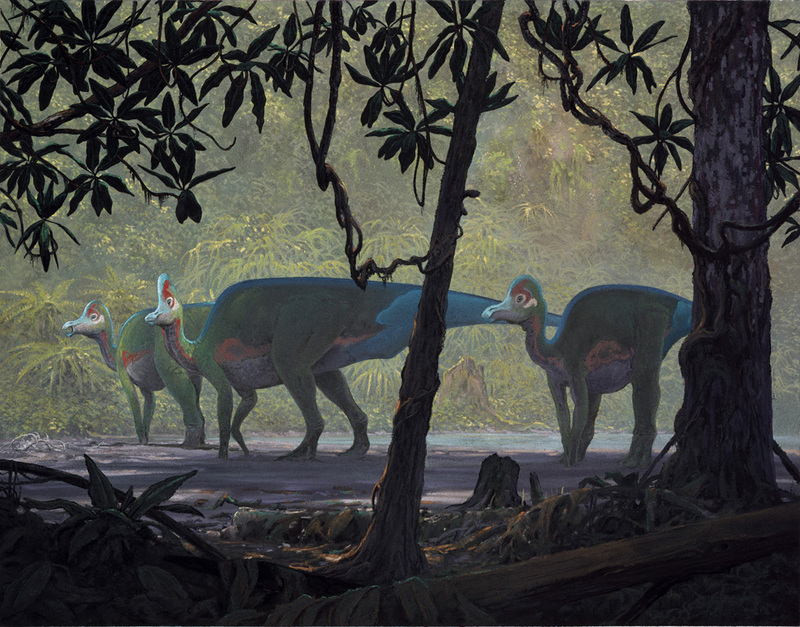 The image depicts the duckbill dinosaur Maiasura traveling in a small group composed of individuals of various ages--from adults to year-old (or more) juveniles. Pencil and graphite dust on 2-ply bristol, 18 x 28 inches, 1985. 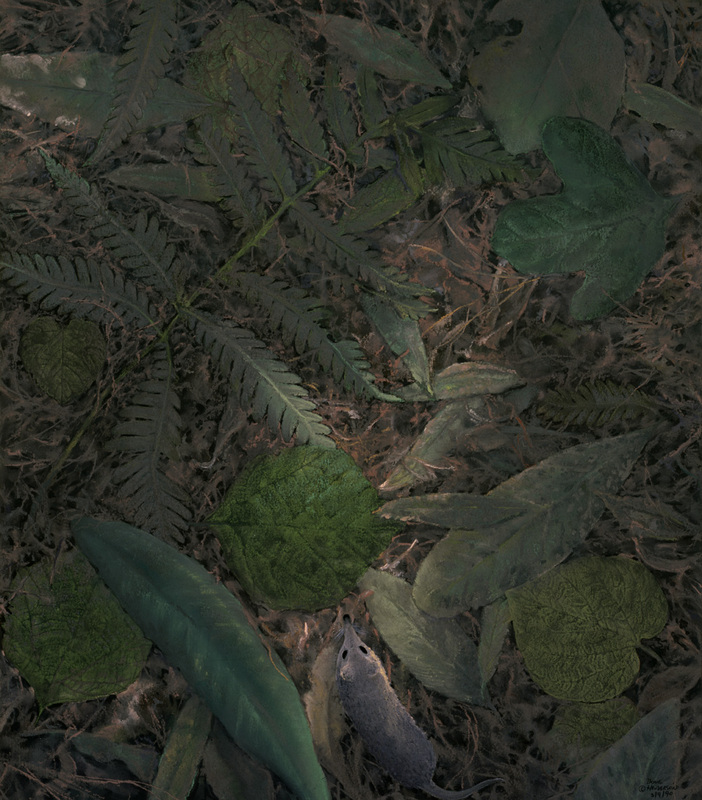 A small mammal forages in a Cretaceous forest litter of fern fronds, conifer needles and the leaves of such flowering trees as Sassafras, Sycamore, Magnolia--and the willow-like leaves of a plant with the poetic designation of Dicot 25. 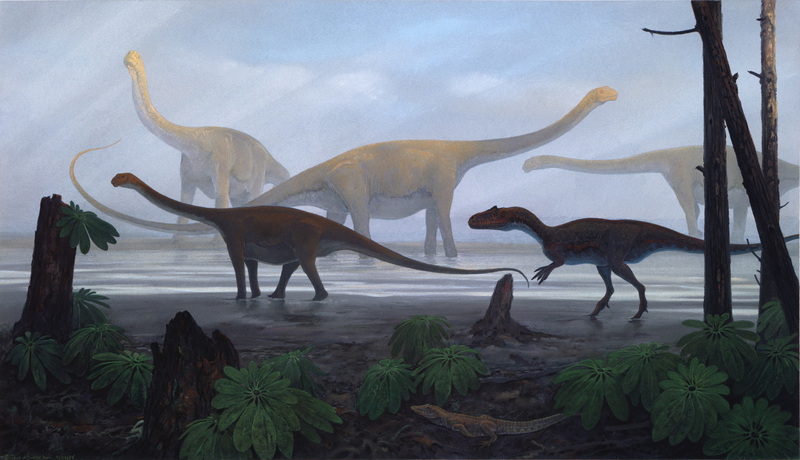 The scene represents the late Cretaceous Two Medicine Formation of central Montana some 80 million years ago. Pastel on 140lb watercolor paper, 19 x 22, 1990. From the children's book Living with Dinosaurs, 1991. This open edition inkjet (giclee) reproduction is of a pencil drawing I did in 1985 for the Museum of the Rockies in Bozeman, Montana. The work is titled "Snow White Loose in the Nursery". 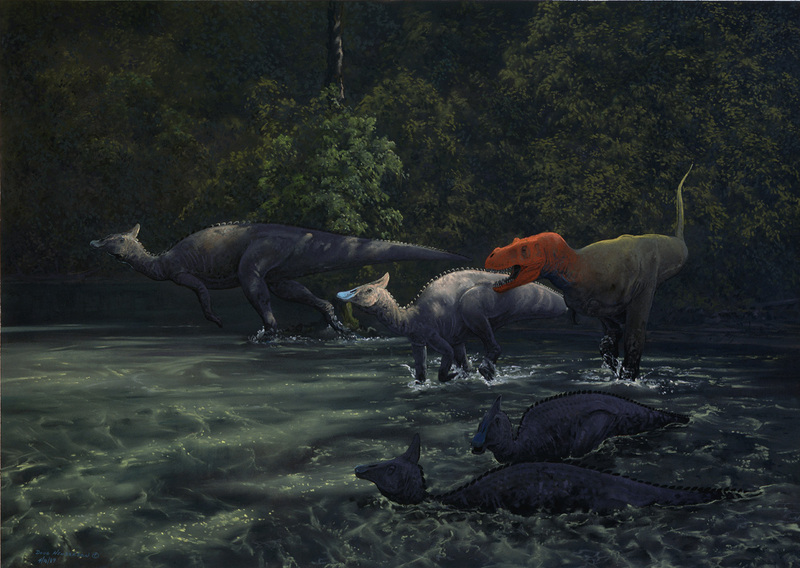 The image depicts a group of Maiasaurs (duckbill dinosaurs) and the carnosaur Albertosaurus on a freshwater lake in western Montana during the late Cretaceous some 80 million years ago. Pencil and graphite duat on bristol, 18 x 27 inches, 1985. Collection of Musuem of the Rockies. This open edition giclee (inkjet) reproduction is of a pastel drawing I did in 1985 as a preliminary design for a larger mural for the Academy of Natural Science in Philadelphia (the larger mural painted by another artist). 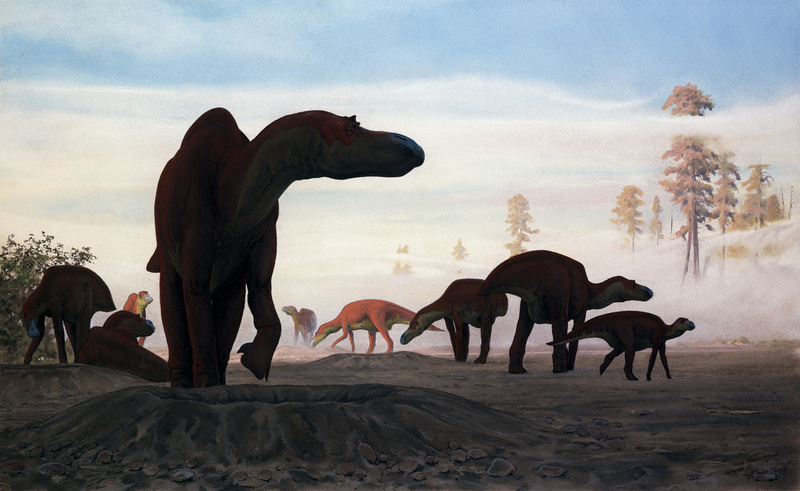 The image depicts a group of Maiasaura tending their earthen nest mounds near present Choteau, Montana. The reconstruction is based on fossi remains of these duckbill dinosaurs and their association with nest sites containing juvenile bones and egg shell fragments, all found in 80 million year old freshwater sediments in the Two Medicine Formation. This illustration started as a pencil drawing on thick bristol paper that soon looked too lackluster to finish, so, on a lark, I completed the image in pastel. 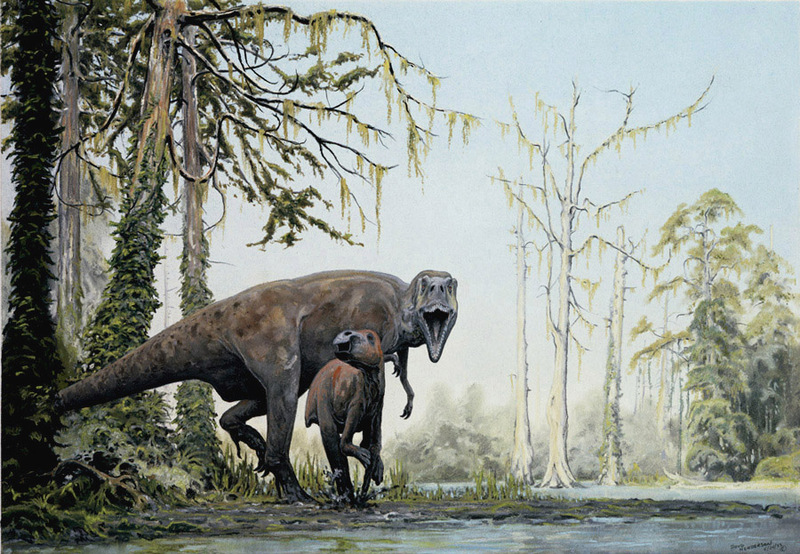 A mother Maiasaur leads her young into the woods to find their own food in Montana during the late Cretaceous some 80 million years ago. Pastel on illustration board, 14 x 18.5 inches, 1985. From the children's book Maia, A Dinosaur Grows Up, 1987. Two dead Einosaurs, late Cretaceous ceratopsians characterized by unique shield horns and a large curved nasal horn. Perhaps having drowned during a stream crossing, the animals' carcasses will eventually decompose, scattering their remains in downstream sediments of the Two Medicine Formation in Montana, some 80 million years ago. A young plesiosaur, having traveled well upstream from the inland sea, passes by. Pencil and graphite dust on 2-ply bristol, 19 x 25, 1987. 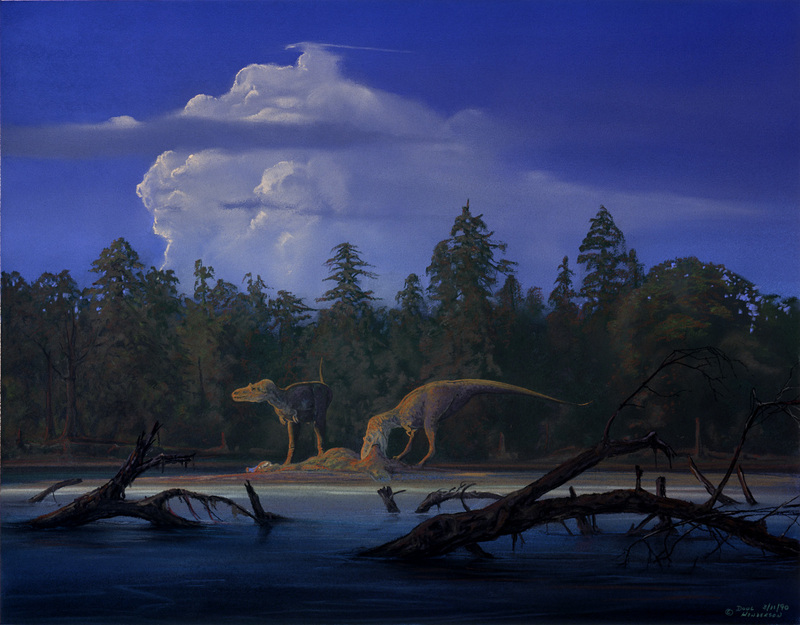 Two Albertosaurus, large late Cretaceous carnosaurs, feast on a duckbill dinosaur on a sandbar in the middle of an upland river in Montana some 80 million years ago. Pastel on 140lb watercolor paper, 17 x 22 inches, 1990. From the children's book Living with Dinosaurs, 1991. A large pterosaur glides above a river flowing through lowland Montana toward the inland sea during the Two Medicine. 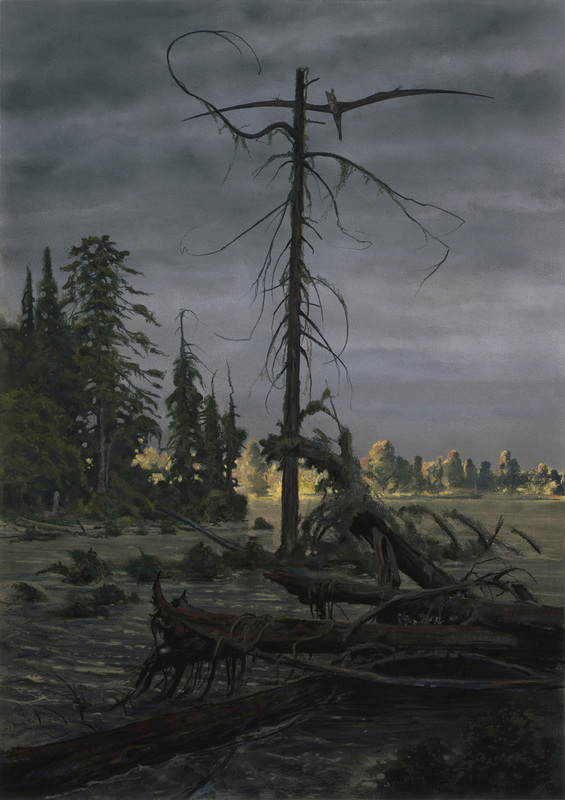 Pastel on 140lb watercolor paper, 16.5 x 23.5 inches, 1985. 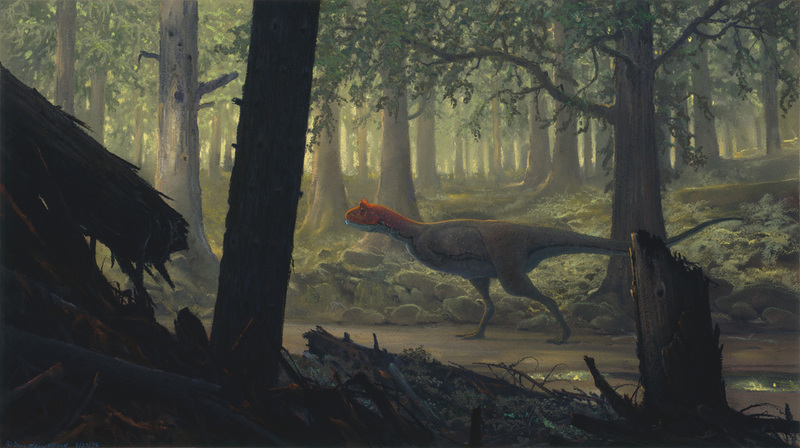 A young Maiasaur named Maia flees from the theropod Albertosaurus in late Cretaceous Montana some 80 million years ago. Pastel on 140lb watercolor paper, 13 x 19 inches, 1983. From the book Maia, A Dinosaur Grows Up, 1987. 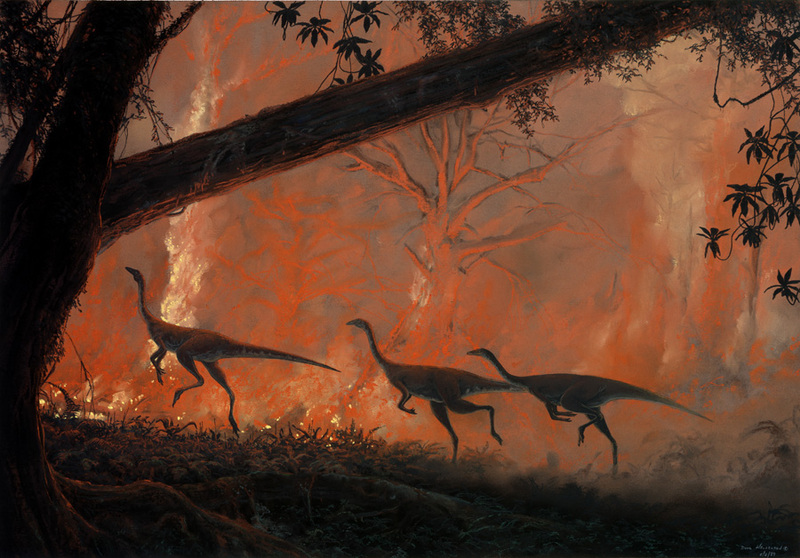 Three Struthiomimus, dinosaurs looking remarkably like large ground birds, run along the front of a forest fire. Fires caused by drought and lightning occurred as natural events 80 million years ago in the late Cretaceous just as today. 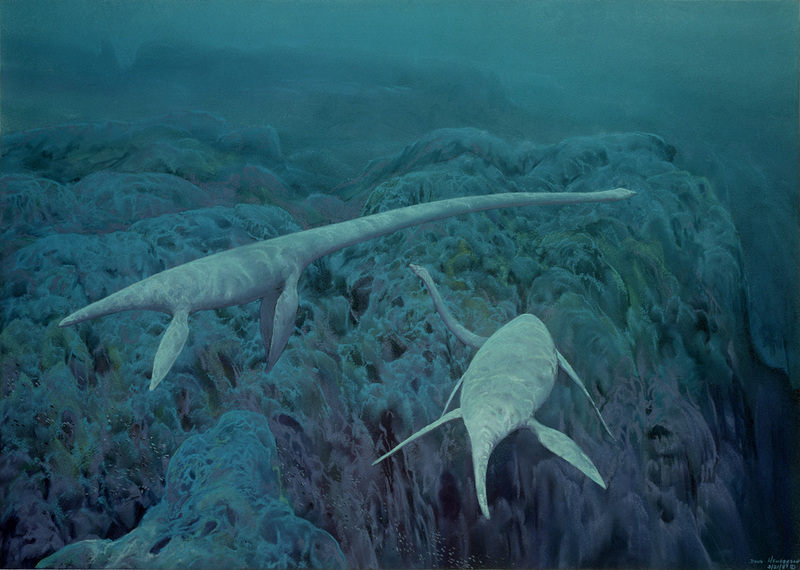 Pastel on 140lb watercolor paper, 18 x 26 inches, 1989. from the book Dinosaurs, A Global View, 1990. 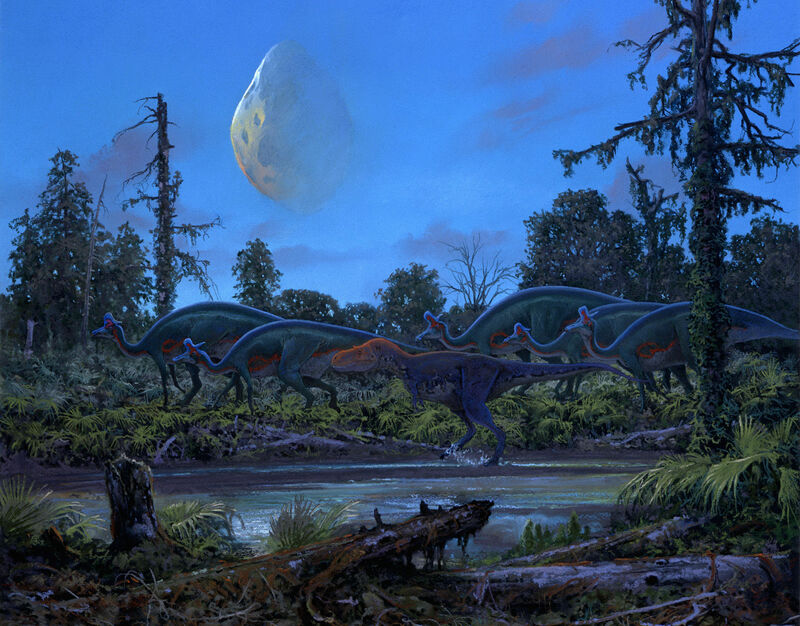 A group of Brachylophosaurus, large duckbill dinosaurs, are known from well-preserved specimens found in north central Montana from late Cretaceous sediments some 75 million years old. Pastel on 140lb watercolor paper, 17 x 27.75, 2005. 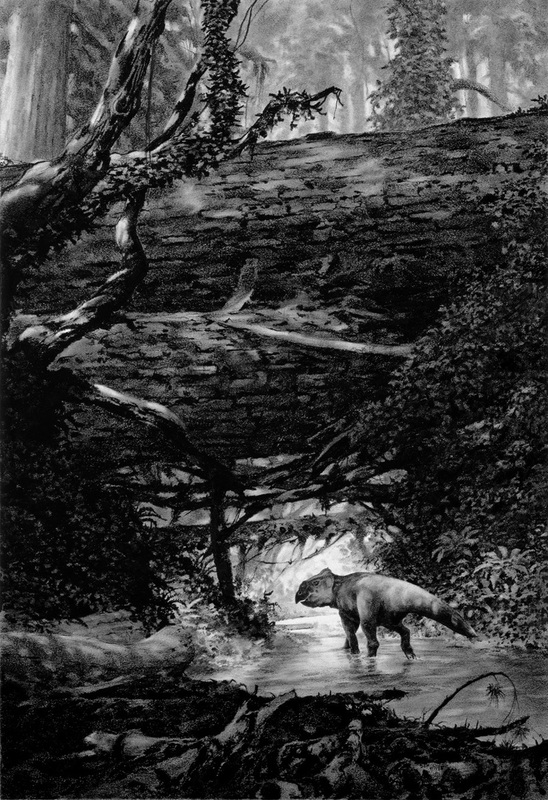 A Tyrannosaur stands poised and alert in a stream channel, seemingly attuned to something of interest, surrounded by a lowland, semi-tropical late Cretaceous forest appropriate for eastern Montana some 65 million years ago. Pastel on 140lb watercolor paper, 15 x 27.25 inches, 1992. From the book The Complete Dinosaur, 1992. 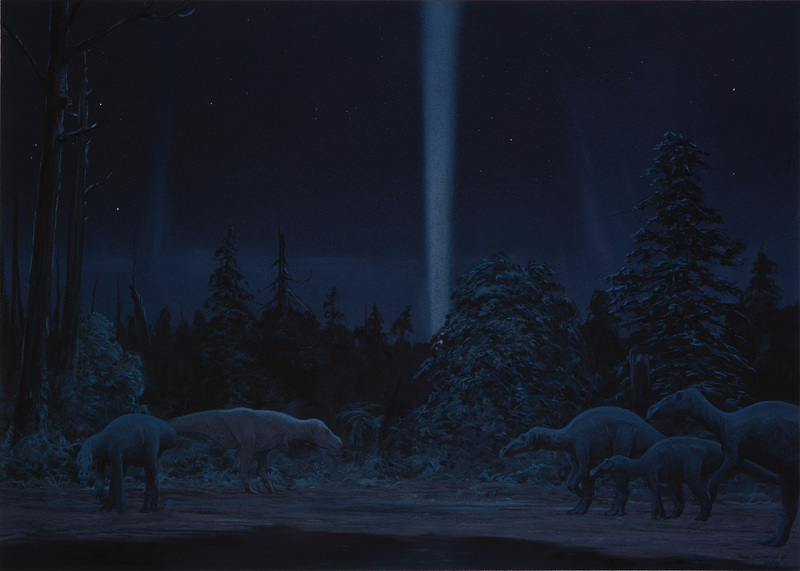 A tyrannosaur stalks a group of Anatotitan/Edmontosaurs in high-latitude darkness of North America during the late Cretaceous. Pastel on 140lb watercolor paper, 18 x 25.5 inches, 1989. Done for the book Dinosaurs, A Global View, 1990. A Kronosaur plies an ancient Australian sea. Pastel on 140lb watercolor paper, 17.5 x 25 inches, 1989. 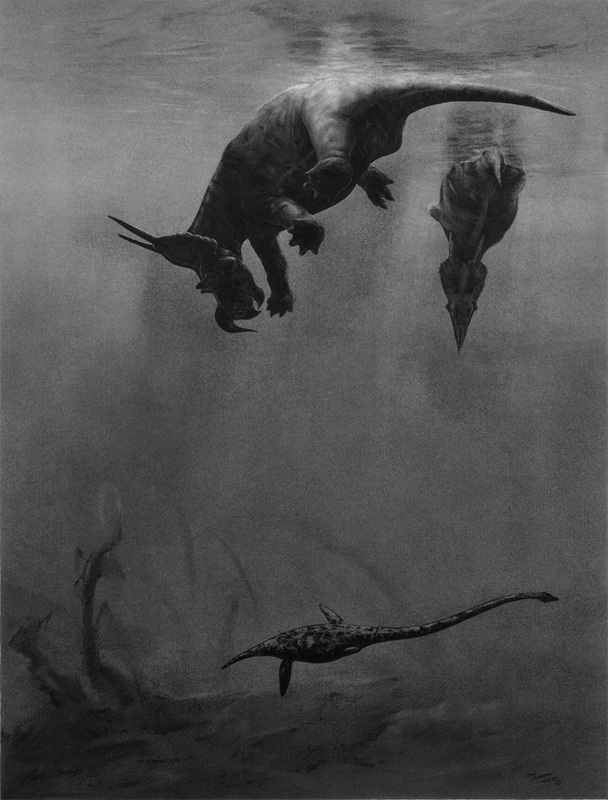 Done for the book Dinosaurs, A Global View, 1990. The scene represents the late Cretaceous of Mongolia and depicts a Tarbosaurus charging a group of Saurolophus, duckbill dinosaurs common to both Asia and North America. Pastel on 140 lb watercolor paper, 18 x 25.5 inches, 1989. From the book Dinosaurs, A global View, 1991. 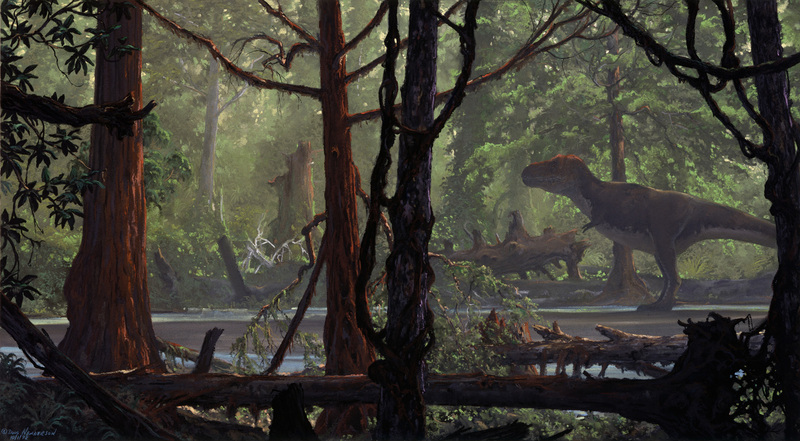 A tyrannosaur stands in a grove of ancient metasequoia in eastern Montana during the late Cretaceous, some 68 million years ago. Pastel on 140lb watercolor paper, 18 x 18 inches, 1992. From the children's book Digging Up Tyrannosaurus Rex, 1992. 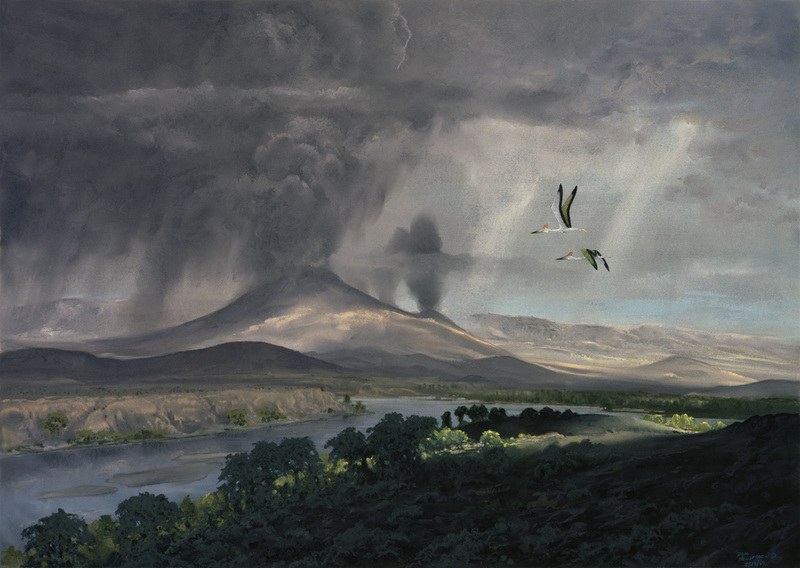 A representation of an eruptive episode of the Deccan Traps, a super basalt flow in India spanning thousands of years that occured toward the end of the Cretaceous Peroid, some 67 million years ago. 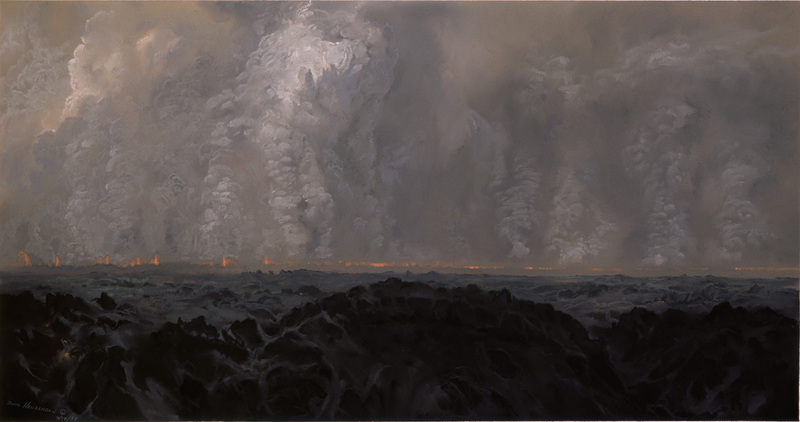 Pastel on 140lb watercolor paper, 14 x 26.75 inches, 1989. From the book Dinosaurs, A Global View, 1990. 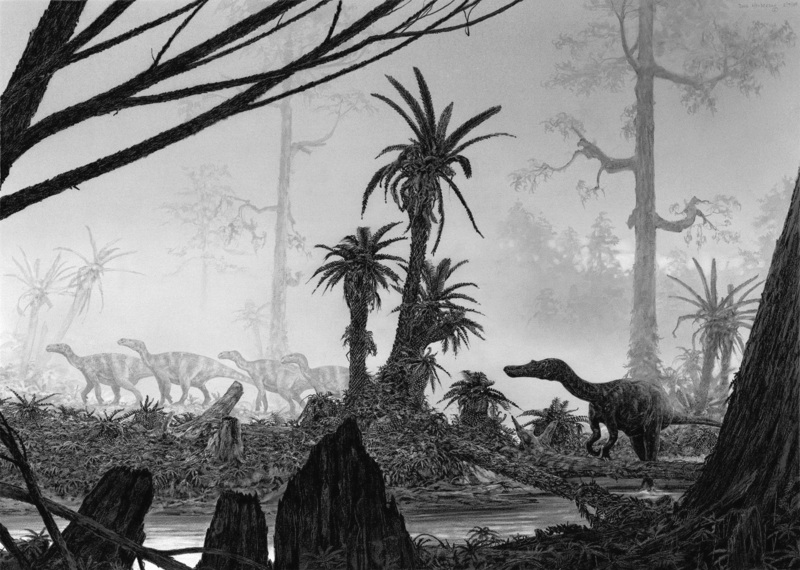 An Albertosaurus stalks a small group of Lambeosaurs in a southern region of western North America during the late Cretaceous, some 67 million years ago. An asteroid approaches in a pre-dawn sky, moments from reaching the atmosphere as it decends into Earth's shadow. 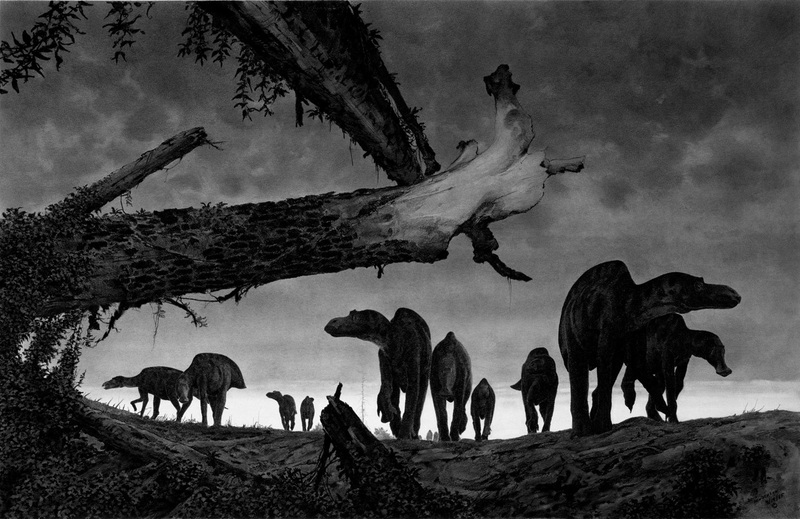 As large as the asteroid appears in this illustration, one would have to imagine the animals viewed at a considerable distance through a telephoto lens. Pastel on 140lb watercolor paper, 20.2 x 22.25 inches, 2004. Commisioned by the Florida Natural History Museum. 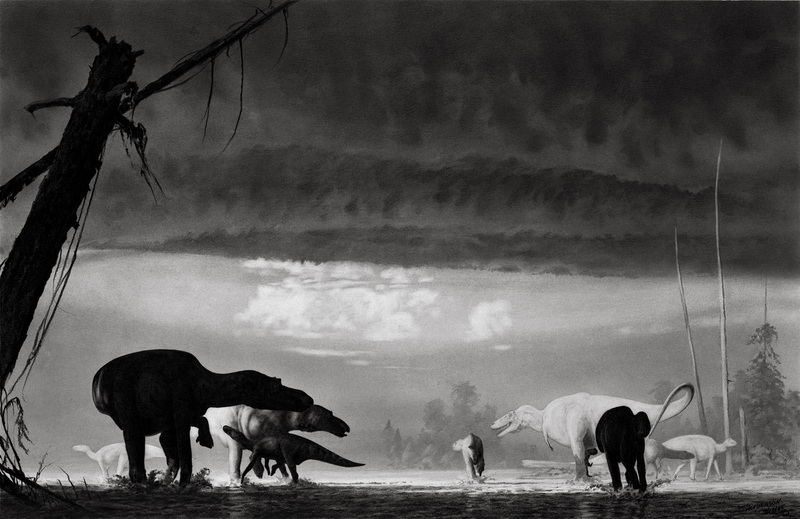 A selection of images related to the early and late Cretaceous Period.